The Glacier Bay Top Mount Stainless Steel 20.9inch x 31.7inch x 9 inch deep double Bowl Kitchen Sink is with a contemporary and dual mount design. 18-gauge premium 304 series stainless steel, tight radius angle, the multi-layer undercoating significantly reduces noise when the sink is in use and prevents condensation. The stainless steel design complements many decor styles and the top mount installation allows for simple integration into your kitchen design. Easy to install with mounting hardware included. Limited Lifetime Warranty. This Glacier Bay double bowl kitchen sink is made of composite granite and is 30 inches wide. This sink is bright silver in colour and is also chip, scratch and stain resistant. Mounting hardware is included for easy drop-in installation, and features up to 5 knock-out holes for flexibility when placing faucets, soap dispensers, side sprays, etc. Strainer is also included. 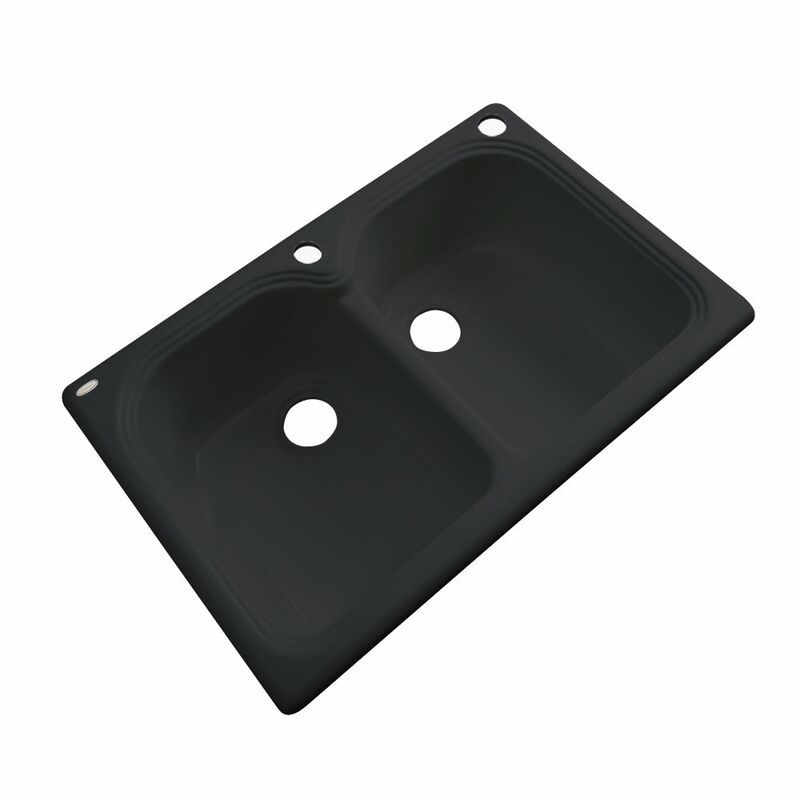 Hartford 33 Inch Double Bowl Black Kitchen Sink It has the beauty of porcelain with strength of cast iron yet lighter weight. The insulated construction absorbs waste disposal noise and resists stain, rust, oxidation, chipping, and scratches. The surface can be polished with ordinary liquid sink, countertop, or auto polish to maintain beauty and luster. It is versatility designed for both Drop-in and undermount ready for quick and easy installation. No mounting clips required for Drop-in installation. Plumbers putty for drains and silicone sealant for perimeter of sink is all that is needed. All Thermocast brand Cast-acrylic sinks are certified by the National Association of Home Builders Research Center and carry a Lifetime Warranty. Hartford 33 Inch Double Bowl Black Kitchen Sink is rated 5.0 out of 5 by 2. Rated 5 out of 5 by jcbvt from Beautiful! Beautiful sink with very classy yet modern lines. Deep, large bowls. I was a little concerned because the picture online made it look more of a dull/matte finish, but it has a super glossy finish. Couldn't be more pleased!